Photo courtesy of Air BP. When putting fuel in your car’s engine, clearly there are implications for selecting an incorrect product. For aviation, the consequences of such a mistake are far more severe. The wrong fuel in an aircraft could cause a loss of engine power, severe engine damage or failure — all of which could be catastrophic at 10,000 feet. A new fuel labelling scheme for the aviation industry is currently in development, by an ASTM Aviation Gasoline Dyes and Markings Task Force, to try to eradicate such occurrences. Even though stringent controls are already in place to reduce aircraft fuel contamination or misfuelling, it happens. The current process is not foolproof, and humans are not infallible. Aircraft refuelling is completed by a diversity of individuals with variable skills, experience and cultural backgrounds. Further, refuelling may be performed in difficult situations — battling inclement weather or time pressure. Dyes and markings are widely used for facilitating fuel identification for both security and fiscal purposes. Their application imparts distinctive colours, or traces on petroleum products and allows users and enforcement officers to distinguish easily between grades, ensure adherence to relevant specifications and, in many cases, to aid in the prevention of fuel theft. Aviation fuels are commonly known by their name and colour, for example Avgas Grade 100L (blue). The visual representation of these fuels also includes a placard system on storage tanks, to designate fuel types and grades, and near refuelling ports. Historically, the range of aviation fuels available has been somewhat limited, with aviation gasoline (Avgas) and aviation turbine fuel (Jet fuel) the principal products. Extensive literature has accompanied the use of these fuels to ensure compliance, such as EI 1597 Procedures for overwing fuelling to ensure delivery of the correct fuel grade to an aircraft, and SAE Aerospace Standard (AS) 1852 that defines bespoke fuel nozzle dimensions for different fuels. This relative simplicity is, however, set to change. Speaking at the ASTM D02 Committee meeting in Atlanta, Georgia, U.S.A., in December 2018, Air BP’s Aviation Fuels Research and Development Manager Alisdair Clark detailed some of the movements occurring in the aviation fuels market and their implications for fuel labelling. Clark is chairman of the task force, with support from Thomas Albuzat of Swift Fuels, a U.S.-based unleaded Avgas supplier. 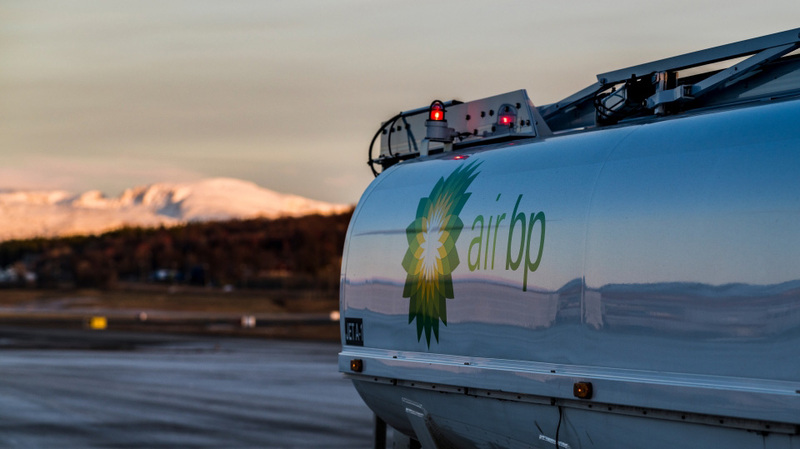 The prospect of new unleaded Avgas grades and a likely leaded–unleaded transition market is set to increase the complexity in aviation fuel delivery. With greater choice, comes greater risk. Alongside the complication of additional Avgas grades, Clark outlined a variety of current hazards that intensify the likelihood of misfuelling — including when an aircraft is leased, refuelling is completed by another party, an alternative aircraft engine is retrofitted in a common aircraft, or when a pilot is at an unfamiliar airfield. Clark highlighted the need for an updated labelling scheme that ensures the appropriate fuel is supplied to the correct aircraft, is simple to learn and use by a broad range of the population — irrespective of language or cultural barriers, where visual impairments such as colour blindness are accounted for, is suitable for use in fluctuating weather conditions, and allows for the future expansion in the type of fuels. A proposed new ASTM fuel labelling scheme will apply to aircraft fuel tanks, storage facilities, distribution facilities and refuelling nozzles. Development of the new fuel labelling scheme by the ASTM task force will occur in two phases. The first is a rationalisation process whereby the group will eliminate outmoded symbols and reclaim Avgas colours for possible future industry use. This process is already well underway, says Clark. The task force has retrieved several colours from redundant grades including ASTM D910 Grade 80 (Red), ASTM D6227 Grade UL82 (Purple) and ASTM D6227 Grade UL87 (Yellow). A ballot for the removal of leaded Grade 91/98, dyed Brown from ASTM D910, is planned in the first quarter of 2019. Decals and markings play a vital role in accurate fuel selection. The goal of Phase two is the development of “new decal/placard designs for global use to help prevent misfuelling in combination with the allocation of grade dyes/colours.” Designs could include words, shapes and colours. However, the creation and roll-out of a placard system that is accepted throughout the globe, which achieves maximum fuel security, and future proofs aviation fuel expansion is not easy. The task force says the new design will follow a “scientific approach to assess human understanding,” based on decal recognition and will likely use a computerised formal assessment tool to aid selection. Research participants shall include airfield staff, owner-operators and regulating agencies who will be exposed to labelling prototypes under a wide array of environmental conditions. To achieve the best possible outcome for the aviation industry, the task force will conduct research into prior labelling, advertising and human factors; undergo liaison with and promote awareness to industry stakeholders (pilot associations, airfields, regulators, etc.) and standards organisations on prototype design and suitability of labelling; as well as considering aircraft/airfield restrictions, cultural aspects and much more. A broad industry engagement is critical to the success of the project, says Clark, with the Aviation Coordinating Research Council already aware and supportive. Baere Aerospace, Purdue University and BP prepared a proposal in the third quarter of 2018 seeking Federal Aviation Administration (FAA) Research Grant funding for the project. Further developments are expected in 2019.